I'm sure my list will change as the year progresses, but at least it's a starting point. As an added bonus, I own the majority of these titles already, so I can at least work on my continued to goal to read books I already own. What classics are you hoping to read next year? Will you participate in a challenge to reach your goal? 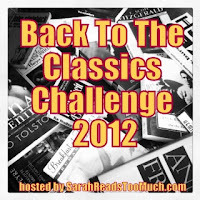 Ok I read Little Women for the classics challenge this year and did not like it. Though, I am in the minority with my opinion, it seems to be one of those books that if you didn't read it as a young woman, it seems to lack something. I also read Lady Chatterley's Lover for the classics challenge this year and liked it quite a bit! Id' recommend that any day. This is a comprehensive list to start with! and you have many of them you say so you will get to it eventually. Gone with the Wind. The best. I keep thinking I will read War and Peace someday. My mom loved it. Awesome list, especially the choice of Shakespeare, Shakespeare, Shakespeare for the play. Brenna - Really? I've heard so many good things! You might be on to something with the age at which you read it though. I've heard similar arguments about Catcher in the Rye. Mystica - I'm really glad to be reading (or aiming to read, at any rate) books that I already own. Ann - I have so many books like that! War and Peace is on my 26 by 26 list, and I've heard only wonderful things about Gone with the Wind. Red - Thanks! I've read a lot of his works, but not all of them. Although I have read some of the less common ones, that means I haven't read some of the most famous ones. Like the Henries. And The Tempest.